Endive (/ˈɛndaɪv, -dɪv, ˈɑːndiːv/) is a leaf vegetable belonging to the genus Cichorium, which includes several similar, bitter, leafed vegetables. 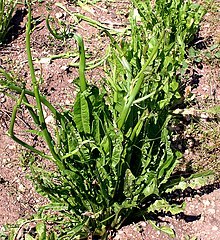 Species include Cichorium endivia (also called endive), Cichorium pumilum (also called wild endive), and Cichorium intybus (also called common chicory). Common chicory includes types such as radicchio, puntarelle, and Belgian endive. There is considerable confusion between Cichorium endivia and Cichorium intybus. Cichorium intybus endive is popular in Europe, and is also known as leaf chicory. Endive is rich in many vitamins and minerals, especially in folate and vitamins A and K, and is high in fiber. It also contains kaempferol. ^ "Chicory and Endive". Innvista. 2013-07-31. Retrieved 2013-08-18. 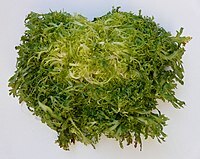 ^ "Endive | Archives | Aggie Horticulture". Plantanswers.tamu.edu. Retrieved 2013-08-18. Chisholm, Hugh, ed. (1911). "Endive" . Encyclopædia Britannica (11th ed.). Cambridge University Press. "Endive" . Collier's New Encyclopedia. 1921. This page was last edited on 7 February 2019, at 13:12 (UTC).